Konda Polling Agency has announced a report revealing the changes in religiosity and life styles in Turkey between 2008 and 2018. While governing Justice & Development Party AKP has been criticized heavily for harming secularism in Turkey by pressuring society to become more pious, the poll by Konda points in another direction. According to the report announced by Konda, number of religious people in Turkey has been on the decline while atheists has tripled. In terms of reading habits, social media has replaced newspapers and TVs as primary news sources. Report also reveals that while home-owners made 74% of the population in 2008, this number fell down to 66% in a decade. Number of house-renters increased from 21% to 26%. In terms of choice of shelter, apartment blocks have increased from 33% to 59%. The report also states that while in 2008 the percentage of people who were satisfied with their life was 57%, this has dropped down to 52% in a decade. While average age in the country has increased, the percentage of population that is married has declined from 71% to 65%. One of the most striking parts of the report was the part on faith & belief. Number of people who would define themselves as “religious” decreased from 55% to 51% in a decade while there was an increase in those who defined themselves as “faithful” from 31% to 34%. The number of people who abstained from alcohol has decreased from 13% to 10%. On the other hand those who define themselves as atheists has tripled in a decade increasing from 1% to 3% while those who state that they do not believe in God has doubled from 1% to 2%. In the chapter on “prayer” it has been revealed that the number of people fasting during Islamic holy month Ramadan has decreased from from 77% in 2008 to 65% in 2018. On the other hand, the number of women wearing headscarf has increased from 52% to 53% while those wearing a more conservative form of cover, turban have dropped from 13% to 9%. According to Konda’s poll on life styles, 61% of the population was getting their news from newspapers in 2008 while this number dropped down to 28% in 2018. TV viewers has also decreased from 98% to 84% in a decade while social media has almost doubled, from 38% to 72% in a decade. 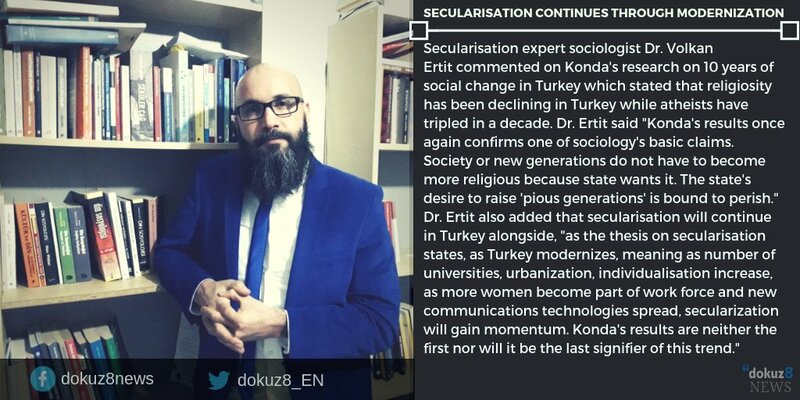 Secularisation expert sociologist Dr. Volkan Ertit commented on Konda Polling Agency’s report on 10 Years of Social Change in Turkey Research stating “government policies do not lead to pious generation” as he said secularisation continues through modernization.